Update, March 20: As Elton John might say, the glitch is back. Jäger’s shield bug has cropped up again. Today’s Rainbow Six Siege update included a handful of fixes for major bugs, including an invisibility glitch and the painful loadout resets. While it’s good those have been stamped out, another bug has returned, and it seems players are once again exploiting the shield glitch. If you’re new to Rainbow Six Siege, we’ve got a guide to the best operators to get started on. The shield glitch – primarly associated withJäger – was first discovered earlier this year, essentially giving the operator a mobile shield that lets them shoot without taking fire. It was a significant exploit, and one that was quickly stamped out the first time, but now it’s back. Ubisoft have been made aware of the issue from a number of posts on Reddit, and are working on another fix. Update, January 5:Ubisoft have a fix for the Jäger shield glitch, and plan to deploy it early next week. Rainbow Six Siege’s game-breaking shield glitch is getting fixed sooner rather than later. Ubisoft confirmed onRedditthat a fix for the Jäger glitch has been validated, and the team are preparing a build to deploy the update. They don’t have an exact date for the patch, but they “are targeting earlier in the week.” Additionally, testing for the full 4.2 patch is also scheduled to begin next week on the TTS. Original story, January 4: Despite being a constantly growing game, Rainbow Six Siege isn’t without its drama and bugs – the latest one, though, is pretty extreme. Players have discovered a bug with one of the game’s operators that allows them to reliably cover their head with a shield and effective make themselves invincible from a certain direction. The bug involves a somewhat complex process of button presses where a player must be playing asJäger with his deployable shield equipped. In the interest of not making the exploit even more prevalent, we won’t post a full guide, but it’s not hard to find a tutorial online, and pulling it off is pretty easy. 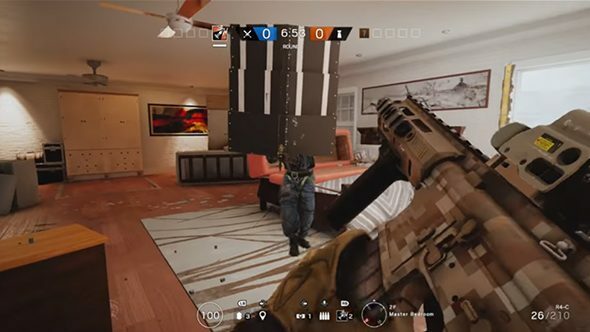 After this, the deployable shield will be placed on top ofJäger’s gun, acting as a giant shield that enemies cannot shoot or see through.Jäger, on the other hand, can see through it and shoot through it perfectly fine. If you can’t shoot his body, due to waist-high cover, it makesJäger pretty much invincible from one direction. The Rainbow Six Siege subreddit have called on Ubisoft to take action – due to the timing, many developers have been with family for the holiday season, and Matthew Szep (community management team lead and previously community manager on Rainbow Six Siege) has said on reddit that a few developers have been working on a fix, with test results expected to come back today on whether it will be successful. The reason why it has taken so long, though, is the holiday season: developers have been with family out of the office, so fewer people have been around to fix the bug. As with many things in game development, it’s not an easy fix, and something that sounds as simple as “disable the operator” isn’t really that simple at all. A timeframe for bug to be fixed is expected to be published today, but that depends on the internal tests. The bug itself isn’t entirely new, although this seems to be the first time it has been so prevalent. Due to it being easily repeatable, players are abusing it, although there have been reports of similar bugs over a year ago, with one post giving some evidence that it has previously been an exploit on the operator Frost in the past too.